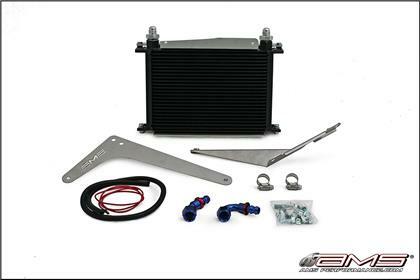 The AMS Performance SST Transmission Oil Cooler Kit is the first of its kind for the SST transmission. Many SST owners know all too well the problems plagued with the dual clutch automatic transmission. Overheating is a common occurrence when driven hard. The AMS SST Trans Cooler helps to prevent that by using a high quality larger capacity heat exchanger with a fan that pulls air through the core the entire time the car is running. This helps to keep transmission temperatures in check and keep that pesky “slow down” light on the dash from coming on so often.